Home » Controversial Topics » Politics » Should the $500 banknote be revived? Should the $500 banknote be revived? I have had trouble understanding why countries would want to eliminate cash but got my eyes opened a couple of weeks ago. The topic came up with a friend of mine who is a retired RCMP officer. He was absolutely in favour of eliminating cash since he could only imagine illegal uses for cash. When I tried to convince him that many people who are not criminals might get caught in scams that would shut down their bank accounts and leave them unable to access the funds necessary for day to day survival he couldn't see it. Inevitably all governments want to have as much control as possible. Eliminating cash would make citizens practical vassals of the state with zero real freedom. Of course a government agent would be in favor of it. The topic came up with a friend of mine who is a retired RCMP officer. He was absolutely in favour of eliminating cash since he could only imagine illegal uses for cash. Hulu is making "The Handmaid's Tale (1985)" into a miniseries again. This work by Canadian author Margaret Atwood envisions a future where women in particular are reduced to slavery. I do remember it as the first time I ran into a work of fiction where the elimination of money is an important way to control society. The value of Canada's currency changes radically if expressed in Canadian or USD. I can see part of the RCMP argument. Perhaps Canada should consider simply not increasing their stock of currency, say limit cash to $2000 per capita with only $1000 in hundred dollar bills. Growth in GDP and increased transactions would simply be handled electronically. If you were going to demonitize a country I think there would be a large percentage that would soon find something to take the place of cash. The government could of course attack this replacement cash but we are now approaching ADZ's vision of the future between the government and the population. If you were going to demonetize a country I think there would be a large percentage that would soon find something to take the place of cash. I have wondered about that as well. But you have to think about the main uses of cash (1) everyday transactions especially ones involving small purchases, (2) as a way to control spending- to make it hurt more, (3) transactions which you want to remain anonymous. This last category could be just so your significant other doesn't know about a gift purchase or a surprise trip, ranging up to as sinister a motivation as you can imagine. (4) Then there is "store of value" which you want to remain independent of any bank. (5) Lastly is as a means of conducting business given a catastrophic event like the the great geomagnetic storm of May 1921, in which massive power outages and other effects shut down much of the infrastructure. Theoretically you could conduct every transaction in your life electronically, including purchasing gum, and still have a safe at home with the equivalent of several thousand dollars in cash. I suppose if Sweden completely demonetizes, then some people could keep Norwegian or Euro banknotes in their home safe. It looks like Sweden is headed for 20 banknotes per capita by this summer, with 5 out of 20 of those banknotes being worth about $2 apiece. They will also have two dozen coins per capita worth about $1. But the big question is how many large denomination notes will still be in circulation. Right now there are 3 new banknotes of value 500kr (~ $58) and 3.8 old banknotes of the same value The old banknotes will be demonetized this summer although they can be turned in at the central bank through next year. The question is how many more new banknotes will be produced as replacements. In Sweden the uniform mobile payment system supported by all major Swedish banks introduced in 2012 has been the major reason that cash is vanishing. In particular it aids in person to person transactions. There is also no minimum payments required to use electronic payments like in the USA. The problem with electronic transactions is you have to have someone else (usually a bank) actually hold your money for you. If they are not willing or able to transfer it to someone else at you request then a problem will occur. I am sure the people of Iceland are still not comfortable with their banks controlling all their funds. The Wizard has had personal experience with this problem as well. My personal experience as an employer would suggest that a significant percentage of the population has had problems with wage garnishees at some time in their lives. Not all these garnishees are legal and some don't hold up in court. If they have no cash, or friends and family can't provide them some cash until a solution can be worked out, these garnishees could end their careers and possibly cause the taking of their own or others live if the problem seemed insurmountable. It's now been 18 months since the Euro zone announced that they would not include the €500 banknote in the updated series (as a means to combat money laundering). Although the old banknotes will remain legal tender, circulation has been reduced by 15% as some people are nervous about keeping the old banknotes. As the banknotes are turned into commercial banks they are returned to the central bank who earmarks them to be destroyed. At this point circulation by value of the €500 is nearly the same as the €100 (by value). The €50 still constitutes over 40% of banknotes by both value and count. The termination of the €500 banknote and the possible end of the £50 would seem to spell the end of the slight possibility of reviving the $500. On the other hand the 1000 Swiss Franc banknote worth roughly $1000 is still going strong. The other possibility is that there will now be hard statistics that some people will use to show that the absence of the €500 banknote has no effect on crime. They might say; at end of 2015 there was a lot more €500 banknotes in circulation than now, but there is no change in crime rates. The sheer cost of producing 10 billion new color $100 notes should revive the discussion about bringing back the $500. 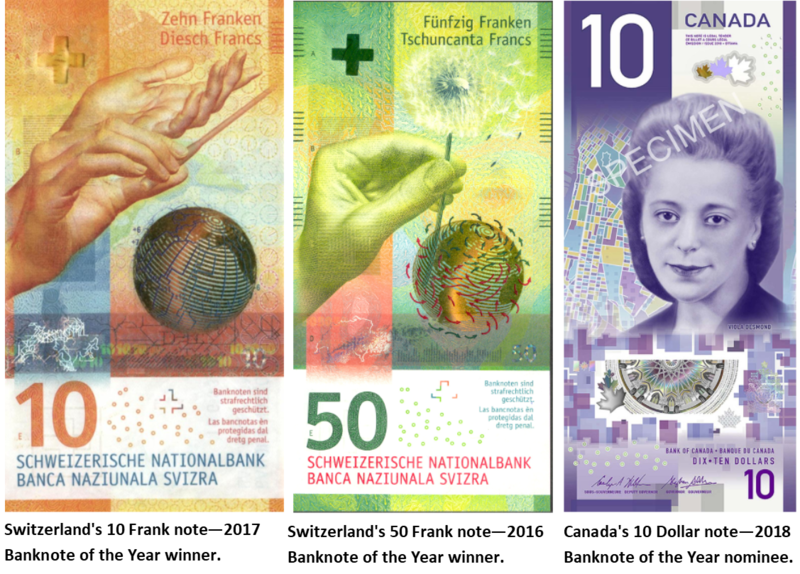 Vertical banknotes are now the new thing with Canada joining the group this year. Their new $10 banknote features a hero of the Canadian civil rights movement from the 1940's. Production of the US $100 color notes initially was 7 billion in FY2012 and Fy2013, but is back up to 1.5 billion new notes per year. How about a nice color vertical $500 banknote for the USA? Of course, it will probably have to be a black woman. No more dead white presidents. Personally, I would like it to be Ronald Reagan. Canada circulates over 2 billion banknotes (roughly 63 per capita). The CAD$100 remains very popular. I favor bringing back the $500 bill. I also strongly favor eliminating the penny and the paper $1 bill. My choice for the $500 bill is Sacagawea. Yes, I know she is already on the dollar coin, but that gets no respect. Interesting thing about Sacagawea is nobody ever took her picture or drew one, so any representation of her is just an educated guess. I prefer it when they make her look hot. I prefer it when they make her look hot. the ugliest people I ever saw. their faces. Men and women both.